Architecture holds a key to the circumstances under which buildings came to be. Any building, from the primitive hut to the modern skyscraper, is inspired by certain ideas, which can be reconstructed in a historical context. Often such a set of conjunctions is called a style, like the familiar ‘Roman’, ‘Gothic’, or ‘Baroque’ style. These loosely defined complexities act as a reference to general features in a given time and place. A style, be it in architecture, poetry, painting or music reflects a certain similarity of ideas at the time of formation. Those ideas are of prime interest in the present investigation, since they can point to the type of division thinking. The all-embracing term ‘style’ is given the following definition by Leonard B. Meyer (in: LANG, 1979/1987; p. 21): ‘a replication of patterning, whether in human behavior or in the artefacts produced by human behavior, that results from a series of choices made within some set of constraints’. This definition clearly puts ‘style’ in an environment of multiplicity. Dynamic terms like ‘replication’, ‘patterning’ and ‘human behavior’ emphasize the complex environment. These words point, in one form or another, to action or movement. Replication is the copying of a once given example. Patterning does basically the same, but on a wider scale. A single example is extended to a multiple construction, which is copied. Human behavior is dynamic by its very nature and operates in a field so wide as to defy comprehension. The set of constraints governing a style consists of physical, biological, psychological and cultural elements. The first three types of actions/movements aim at extension, broadening the outlay of the original concept. The latter movement (constraint) is one of restrictions and the establishment of borders. It is only in the very limitation of its extension that the identity of a style can be known. Meyer distinguished three large classes of constraints (as a subdivision of the fourth notion of action): laws, rules and strategies. They can cross the barriers of the before-mentioned elements: laws can be of a physical or psychological nature, rules may have psychological and cultural overtones. Strategies are ‘compositional choices made within the possibilities established by the rules of the style’. These choices are infinite in number, while the rules of a style are finite. This technical contribution to the nature of style is more complicated than the two-division into a general and an individual style – as proposed by the Swiss art historian Heinrich Wölfflin (1864 – 1945). He made a formal stylistic analysis of motifs within an oppositional framework (presumably guided by duality). Five basic oppositions are given in his book Principles of Art History (1915/1932). They define, in his view, the difference between the classic-Renaissance and the Baroque style. These differences can be applied in other areas of communication as well. The individual style, in contrast to the general style, is found in the work of one individual artist, like for instance the style of Giotto or Rembrandt. The individual style is the result of a particular and personal aesthetic interest and expressiveness of the artist (WOLLHEIM; in LANG, 1979/1987). Architecture obeys to the same distinctions and rules concerning ‘style’ as is being made for music, literature, painting or any other art form. There is, in fact, a considerable overlap between these disciplines. Certain (style) features might enter another discipline and start a new life. Often such a conglomerate of notions makes it difficult to distinguish the ‘real’ typical element of a style on a local level. Albert HOFSTADTER (in LANG, 1979/1987; p. 121) widened the idea of style even further. He stated that ‘style is the expressive articulation, not of this or that particular and determinate volition (…) but of the universal and all-pervading wish of the mind in its given, historical mode of being. It is the wish-to-be, the being-toward-being, which expresses itself in the shape of style in works of art’. Style includes, in his view, also the will of the artist to find the ‘universal’ specifics. The style of measure or ‘classical style’ is based on visible visibility, with its home base in the Third Quadrant (III). 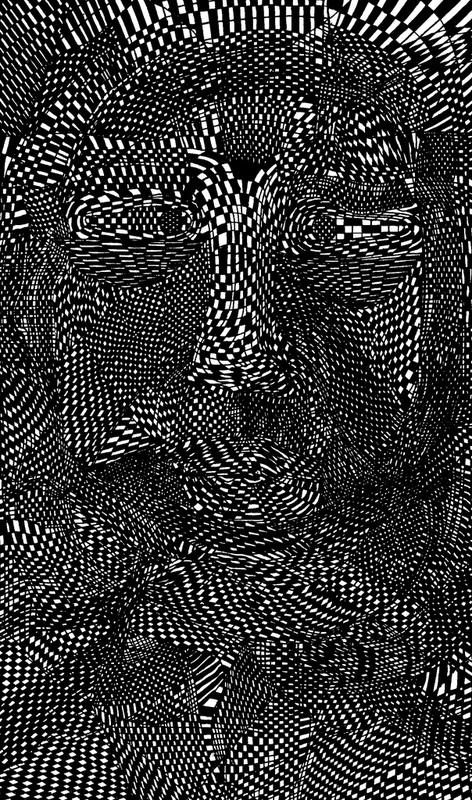 The sense of beauty is derived from static division principles. This style aims at similarity and tries to maintain the boundaries. Paul FRANKL (1938) noted, in his enormously exhaustive book ‘Das System der Kunstwissenschaft’, that the similarity of form (‘Gleichheit der Form’) is a prerequisite for a style. Any nondisciplinary behavior of form is bound to be excluded. The consequences of this attitude can only be counteracted in an environment of higher division thinking. The adoration of the classical style is, in hindsight, a form of stagnation. COLLINGWOOD (1999) pointed in his book ‘The Principles of History’ to the straitjacket of the inductive way of thinking, with its ‘logical compulsion’ to prove the premises in a conclusion. He saw the obligation to prove as the result of a religious belief born in a Christian theology. He pointed in due course to two kinds of historians. Those who fared on the testimony of authorities and others who use their statement in a ‘scissors and paste’ way. They only use the material, which is useful. It was only in the seventeenth century that the systematic examination of authorities was seriously undertaken and a broader basis of history was employed, using non-literary sources. These efforts resulted, according to Collingwood, in the nineteenth century in a form of pigeon holing, using quantitative schemes and groupings to understand history. The value of an architectural style remains a matter of debate. Le Corbusier (1920/1958) downgraded the relation between architecture and style. He called it ‘just a feather on the head of a woman: sometimes it is funny, but nothing more than that’. (‘L’Architecture n’a rien à voir avec les ‘styles’. Les Louis XV, XIV, XVI ou le Gothique sont à l’architecture ce qu’est une plume sur la tête d’une femme; c’est parfais joli, mais pas toujours et rien de plus’). And maybe he was right. Every effort to dig deeper into the nature of a ‘style’ is bound to reach short of its goal. As soon as a particular feature is chosen as a ‘typical’ element of a style, it proves unreliable in a practical application. In the end there is hardly anything typical for a style other than a vague combination of sense impressions tied to each other by a process of analogy applied in the broadest sense. The term rhythm is used both in music, architecture and dance. The word – meaning ‘flow’ in Greek – points to an abstract way of expression related with the dynamic principle (movement) of a communication. Rhythm is the sequential repetition of like appearances. Repetition requires new space. The Austrian art historian Alois Riegl (1858 – 1905) characterized rhythm as the balance between individual parts and the collective whole (GUBSER, 2005). The temporal process (of rhythm) creates – in quadralectic terms – the bridge between the Third (balance) and Fourth (whole) Quadrant. The time perception becomes an important element of the communication. There should be, in Riegl’s view, an interaction of different modes of temporality. He had earned himself a name as an art critic after his study of monuments. Art objects (like monuments) are temporal and spatial and their perception changes in due course. Therefore, the notion of beauty also varies in history. The consistent elements are symmetry (vision), proportion (touch) and order (mind), come together in rhythm. Riegl noted an oscillating process between an emphasis on vision and touch, with a pre-eminence of vision. Rhythm tries to break through the barrier of containment (of the Third Quadrant). It is, according to Von Wersin, the strongest art-creating medium in ornamentation, with repetition as its main instrument. 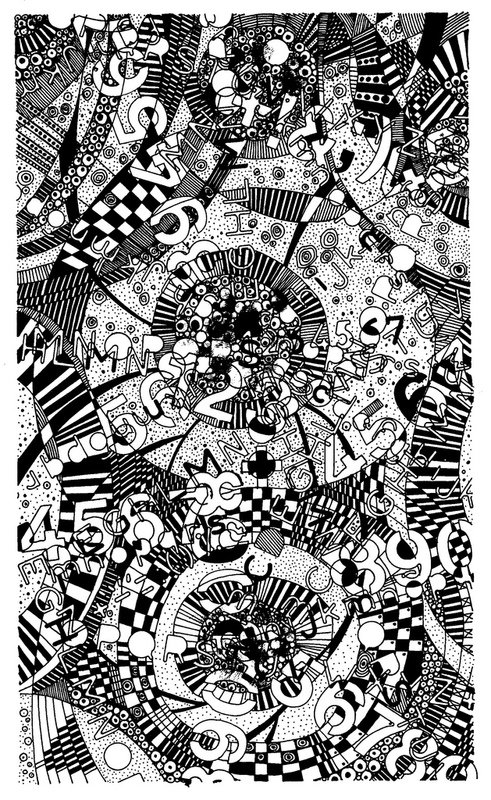 The multiplicity, with its space for understanding, is filled with the dynamism of the expanding part. The intense satisfaction to conquer unknown space (like the Fourth Quadrant) in a harmonic way is part of the positive-human feeling of rhythm. The element of rhythm became an important tool in the hands of the Russian architect Moisei Ginzburg (1892 – 1946). He put the idea of rhythm and dynamics to the foreground in his first book ‘Rhythm in Architecture’ (1923) and elaborated on the theme a year later as part of his book ‘Style and Epoch’ (COOKE, 1995). Ginzburg observed that ‘rhythm is everywhere’ and pointed to ‘movement’ as the core of materialist modernity. He distinguished two types: a movement within the object (like in a machine) and the movement of the architect through the process of design. The analogy of the society with a machine and technology-in-general found a response in the architectural achievements in the early Soviet years. Unfortunately, there was little to go for by the young, revolutionary architects, since Marx’ interests were geared towards literature and poetry rather than architecture. They had to invent their own program to find the role of a ‘positive’ architecture. Rationalization and efficiency became catchwords, giving rise to a Constructivist mood. The passion for number and periodicity was part of this process, both as a measure to reach economic goals and as a distinct guideline in architectural design. This trend might, on the one hand, be rather elementary in which ‘the dissemination of a primitive sense of number could tighten up any organisational or productivity’ (COOKE, 1995; p. 124), but it can also be explained, on the other hand, as an adventure in the unknown mental world of the Fourth Quadrant. It is, in particular, this latter view, which makes the Russian artistic ideas in the Twenties so relevant for the present investigation into the genesis of quadralectic architecture. Rudolf Bode (1881 – 1970) pointed in his book ‘Der Rhythmus’ (Jena, 1920) to the positive influence of rhythmic gymnastic and music on the up-bringing of young children. Unfortunately, his ideas were smoothly incorporated in the racist obsessions of the national socialistic movement of the early thirties in Germany. Bode started as conductor and pianist in Kaiserslautern and Heidelberg and founded in 1911 the ‘Bode-Schule für Rhythmische Gymnastik’ (Bode School for Rhythmic Gymnastics) in München. 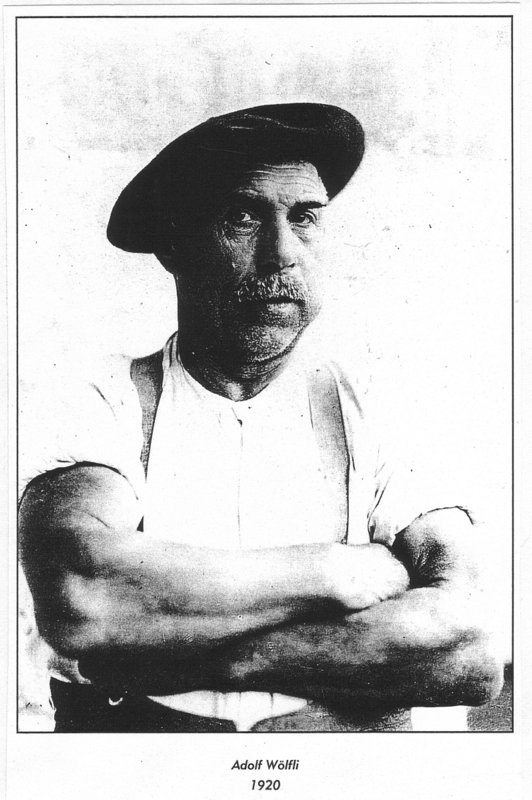 The intentions of Bode might be of a genuine character – and his teachings were still used in the education of physiotherapists after the war. Doubtless music and movement are themes of the Fourth Quadrant, but it is still a disturbing fact that these concepts were so easily incorporated in the oppositional setting of the Nazi ideology. Another contribution to the progress in architectural development was the attention to the dynamics of shape. 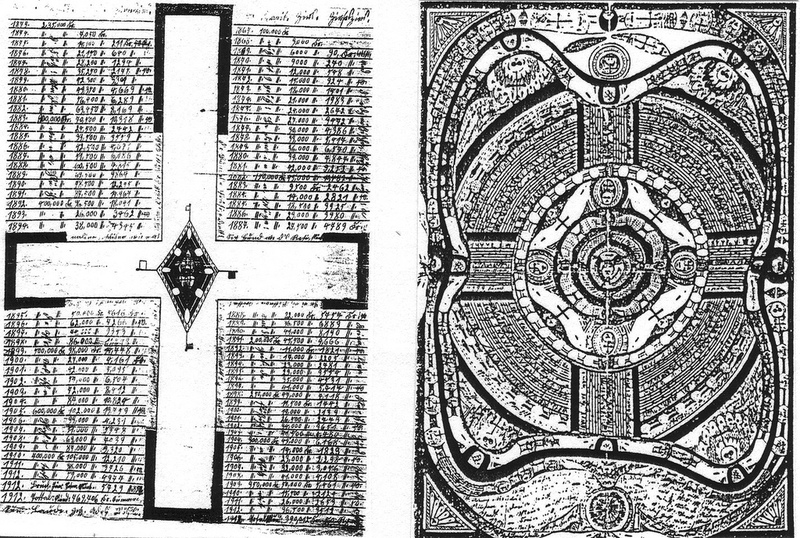 Von Wersin gives four examples of the dynamic tendencies in basic architectural forms (fig. 820). Fig. 820 – Dynamic tendencies in basic architectural shapes (after von WERSIN, 1940). The particular forms indicate a certain idea of dynamism, which is noticed by the observer. These forms – and there are many more of them – carry in them the idea of direction, regardless of their specific details or function. The elongated, upward reaching Grundform of a skyscraper is doing just that: pointing towards the sky. The broad shape of a wall or facade gives a down-to-earth feeling. The intrinsic value (of the horizontal and vertical) is transposed to the sensory system of the observer. These fundamental movements (up and down) are typical for lower division (two-fold) thinking. The pyramid, with its pointed appearance and the round shape have their own vitality, which is more complicated. Dynamism has its own rules, which are incorporated in the communication. The work of the Swiss artist Adolf Wölfli (fig. 821) shows what happens when an internal order is lost. He was a psychiatric patient diagnosed with a bipolar disorder (MORGENTHALER, 1992). His extensive artistic output has an original form language, guided by a horror vacui (an obsessive fear for emptiness). His collection ‘From the Cradle to the Grave’ (1908 – 1912) is a recording of his childhood and an imaginary travelog. Thereafter followed work under titles like ‘Geographic and Algebraic Books’, ‘Books with Songs and Dances’, ‘Album Books with Songs and Marches’ and finally, in 1928, his ‘Funeral Marches’. Anthony STORR (1972/1991) described in his book ‘The Dynamics of Creation’ Wölfli’s work as ‘a compulsion to impose order on a world which he feels to be chaotic or, more simply, wish to compensate in fantasy for what he feels to be missing in reality’. His work can be qualified – in quadralectic terms – as an effort to come to terms with multiplicity in the world of visibility. The disorder (schizophrenia) – which finds its roots in the oppositional thinking of Third Quadrant – is the result of a failure to reach into higher division thinking. The inability to reach for transcendental horizons leaves man with no way out. The horror vacui is the reflection of the ultimate search for nowhere. Fig. 821 – The Swiss artist Adolf Wölfli (1864 – 1930) created a monumental oeuvre during his stay in a mental asylum near Bern. To the left: Zinsrechning, 1912. To the right: Wein. Fennin. Oliander. Karolina-Käller, 1914. 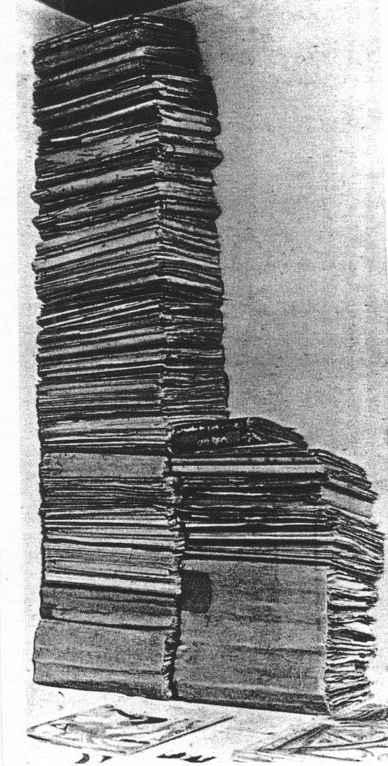 – Adolf Wölfli (1864 – 1930) and the pile of work he left at the end of his life in 1930. A tragic, but recognizable scene. The present writer is familiar with creative dynamism gone astray. Drawings in the period from 1983 – 1987 (see below) are characterized by a complete covering of the empty space, which is typical for the horror vacui. Below is the position given of this period (1983 – 1987) on the CF-graph of the writer (Marten Kuilman, 1947 – 2036). This period coincides with the ‘invention’ of the quadralectic way of thinking from 1983 onwards. No horror vacui drawings are made after 1987, but some minimalistic renderings are known as an aftermath. 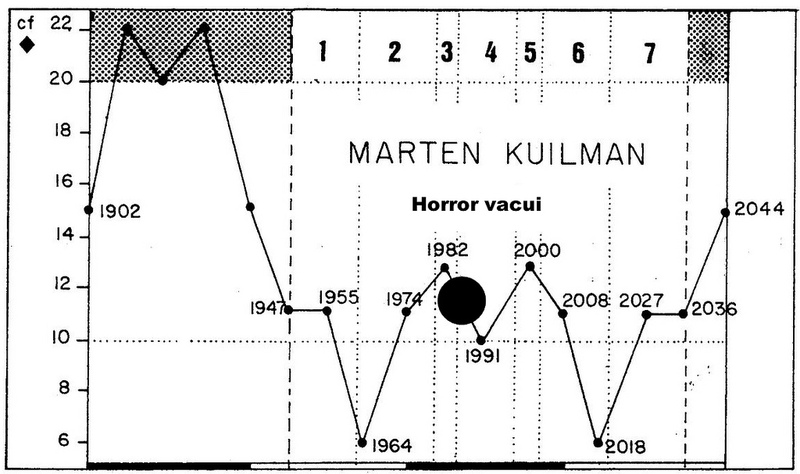 The position of ‘horror vacui‘ drawings in the creative coverage of the life of Marten Kuilman. The CF-graph is based on his date of birth (1947) (FV = first visibility) and the first period of creative expression (1964) (FMA = first major approach). Dynamism (in architecture and art-in-general) is the celebration of the aspect of movement in a communication. However, it cannot exist without a knowledge of its counterpart, the division. Those two items (division and movement) are the heart of any conceivable communication. None of these two should get – in a normal world – the upper hand.